You know when a recipe turns out so well you get lost in the moment, devour every morsel, and when the dust settles, you realize you didn’t take that beauty shot you needed? That’s what happened when I first made these Orange Glazed Blueberry Scones last summer. And then I proceeded to forget each time I made them thereafter. I suspect not many of you find yourselves in this particular dilemma, unless you work as a recipe developer or are obsessed with taking photos of everything you make (guilty on both counts). Thankfully, I did manage to snap a couple of shots to prove their existence beyond the recipe below. When I first made them, it was peak blueberry season, and my love of all things lemon-blueberry had begun to feel tired. 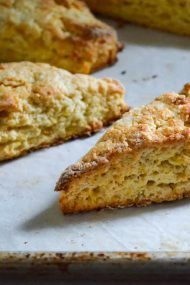 I needed something new, but didn’t feel the need to entirely re-invent the wheel, as I had with these Apple Fennel Scones, which are a sweet scone that pairs wonderfully with savory dishes (sans the icing). 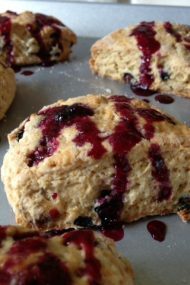 The glaze on those apple fennel scones are what started the wheels turning about mixing blueberries and oranges. It’s not very revolutionary, but sometimes the obvious is right under our noses, and we need a nudge to see it. So, while the photo I’m sharing above shows the scones unfinished, you can get an idea of what the glaze looks like here. And, of course, you can leave the glaze off all together. For a morning treat, that’s actually how I prefer them, feeling the glaze lends itself more to enjoying them with afternoon tea. 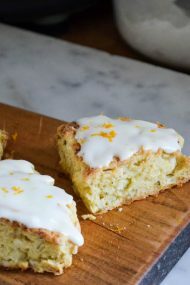 Another bonus, besides ditching the lemon in favor of orange, is it’s a small batch recipe, making just four scones (or six if you want them mini). I find these smaller yield recipes perfect for my tiny tribe of three. Some baked goods, like this one, are forgiving, and meant to be eaten a day or two later. 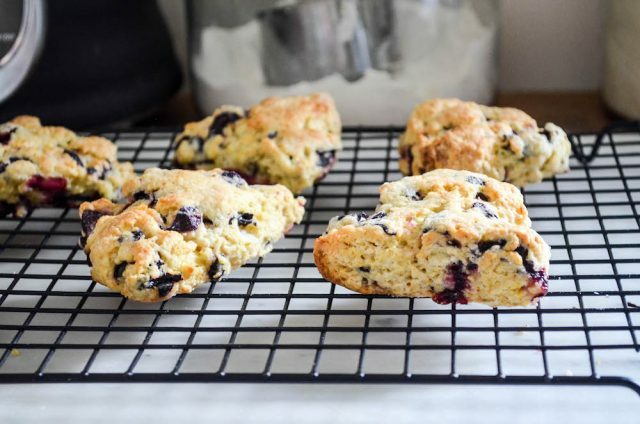 Scones, though, fall into the must eat within a couple of hours category, for me at least. Surprisingly, the extra scone never causes an argument over who gets to eat it. Of course, now that I uttered the words, I’m sure we’ll be arm wrestling each other the next time I make them. Preheat the oven to 425ºF (220ºC). Line a small rimmed baking pan with parchment paper. Add the flour, sugar, baking powder, zest, and salt to a medium bowl. Whisk to combine. Scatter the butter over the flour mixture, and rub together quickly with your fingers, until it forms a sandy-looking texture with some pebble-sized pieces. Knead the dough in the bowl once or twice until it forms a shaggy-looking dough. Turn the dough out onto a lightly floured counter. 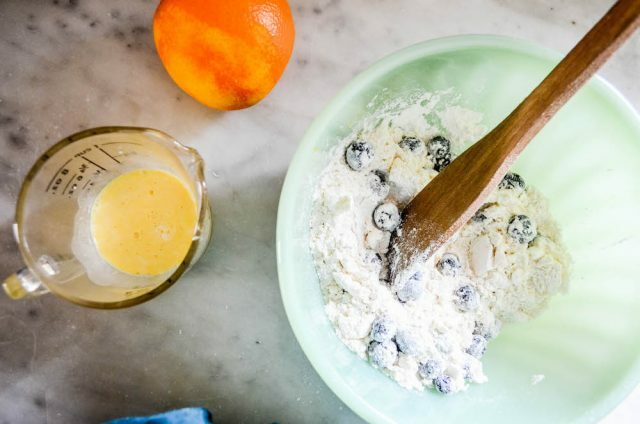 Knead it once or twice to give the dough a smoother appearance. Using your fingertips, press the dough out into a ½-inch thick circle. Cut the dough into 4 triangles. Place the scones on the prepared baking sheet, and brush with tops with the remaining teaspoon of cream. Bake 12 to 14 minutes, until bottoms are deep golden and the tops are golden. Remove from oven and rest tray on a wire rack. Let cool completely before adding glaze. To make the glaze, combine the confectioner’s sugar, orange juice, and butter in a small bowl. Whisk until smooth, and sugar is completely dissolved. Drizzle over the scones. Let the glaze set for 15 to 20 minutes before serving. Can this be made with whole wheat pastry flour? Yum! I feel like these would be perfect to make this weekend but my partner can’t do dairy. I know you’ve done a good amount of dairy-free cooking. Any thoughts on a good heavy cream substitute?